Marcus Thompson, violist, has appeared as soloist, recitalist, and in chamber music series throughout the Americas, Europe, and the Far East. He has been a soloist with the orchestras of Atlanta, Chicago, Cleveland, Saint Louis; The National Symphony, the Boston Pops and the Czech National Symphony in Prague. He performed the West Coast Premiere of the Harbison Viola Concerto with the Los Angeles Chamber Orchestra; the Chicago Premiere with the Chicago Sinfonietta, and the Boston Premiere with the New England Conservatory Honors Orchestra. He has received critical acclaim for performances of the Penderecki Viola Concerto with the MIT Symphony Orchestra in Boston, and London, U.K.; performed Hindemith's Viola D'Amore Concerto, Kammermusik #6, with the Philadelphia Orchestra in Saratoga, the premiere of Olly Wilson's Viola Concerto with the the Rochester Philharmonic, and the premiere of Elena Ruehr's new Viola Concerto 'Shadow Light' with the New Orchestra of Washington. He has premiered and performed many recital or chamber works by MIT composers including Peter Child, Keeril Makan, Charles Shadle, John Harbison, and Barry Vercoe's iconic Synapse for Viola and Computer. His recording of Concerto for Viola, Chamber Orchestra, and Percussion commissioned from composer and organist Anthony Newman in 1985 has just been re-released with five concertos for other instruments by the composer. Thompson's three recordings with orchestra include concertos by Hindemith, Bartok, Bloch, and Serly, along with works by Francaix, Martin, and Jongen. Mr. Thompson has been a guest of the Audubon, Borromeo, Cleveland, Da Ponte, Emerson, Jupiter, Lydian, Orion, Shanghai, and Vermeer String Quartets; and a frequent participant at chamber music festivals in Anchorage, Seattle, Sitka, Los Angeles, Montreal, Edmonton, Rockport (MA and ME), Amsterdam, Dubrovnik and Okinawa. 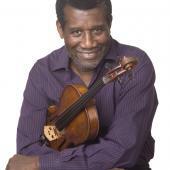 Born and raised in The Bronx, NYC, Mr. Thompson earned the doctorate degree at The Juilliard School. He currently lives in Boston where he is a member of the viola faculty at New England Conservatory of Music and violist and Artistic Director of the Boston Chamber Music Society. Marcus Thompson is the founder of the MIT Chamber Music Society and of the private study program named for MIT alumnus, Cherry Emerson (SM 1941). In 1995 he was named a Margaret MacVicar Faculty Fellow and Robert R. Taylor Professor of Music. In 2015 he was appointed Institute Professor.